Dental implants are surgical interventions. Every surgery comes with some risks, so dental implant problems can occur as well. The good news is that more than 95 % of dental implant surgeries have no complications whatsoever. This percentage can become even higher than 98 % if the patients look after their implants with proper oral hygiene. In this article we want to focus on those less than 2 % of cases in which for some reason this dental technique fails to produce a 100 % perfect results, despite its continuous development and the use of new, always up-to-date materials and procedures. As you could see in the introduction, very few people have to deal with a dental implant problem. However, when some of these problems do occur, they are quite significant. A serious and reliable dentist cannot ignore the problems of even one person. From this short article you can learn about the very little probable, but still possible complications. We provide you with their definition, description and in many cases also with the possible ways of avoiding them. Osseointegration means an adequate structural and functional interaction between the implant and the bone tissue accepting and embodying it. The process of integration between the two structures (implant and bone tissue) usually takes a few months. A frequent cause of unsuccessful implantation is that the jaw bone cannot properly embody the “root” of the artificial tooth, i.e. the implant. An implant is considered faulty when it moves, falls out, or if there is more than 1 millimeter dental bone loss one year after the implant surgery, or more than 0.2 millimeter bone loss two years after the implant surgery. There can be other reasons for failed or incomplete osseointegration: the implant might have been inserted in the wrong angle; the patient’s bone tissues might have insufficient density or quantity; the implant might be overloaded; the tissues around the implant might become damaged. Also, the implant itself might be broken or crooked, or an outside force might damage it. All these factors can lead to dental implant complications. Some patients do not have large enough, long enough or wide enough bone in their jaws to host an implant. In these cases sinus lift and bone grafting can be the solution. But these complementing interventions significantly increase both the time needed for building the implant and the expenses of the procedure. We should note here that the absence of teeth decreases the amount of bone in the jaw, as in the empty spaces there is no chewing, therefore the bone becomes weaker. Patients who have been going on with missing teeth for months or for years, often need bone grafting before dental implants.Bone grafting requires extra time but can solve a dental implant problem for you. Peri-implantitis means the inflammation of the soft and hard tissues surrounding the inserted implant. It is cause by the presence of bacteria in the implant area during the surgery. Per-implantitis can also occur after the surgery, if the patient neglects the hygiene of the implant and its surroundings. A cause for this inflammation can be the cement used for dental implants, if during the surgery it overflows from under the crown and gets into the gum. Peri-implantitis is the most frequent cause of the inflammation of the gum and/or of the bones surrounding the implant. Also, this is the most common dental implant problem. People who have diabetes, smoke, have thin gums or have poor oral hygiene are more likely to develop this dental implant problem. In this sense smoking particularly decreases the odds for a successful dental implant. Another possible, but very rare dental implant problem is the damage of the nerves and tissues around the implant (especially the nerves). If the implant is inserted too close to the nerve, the patient can experience constant pain, or a kind of stinging and numbness in the cheeks, in the gums, in the tongue, in the lips and in the jaws. Nerve damage can be felt for shorter spells, but can be constantly present as well. 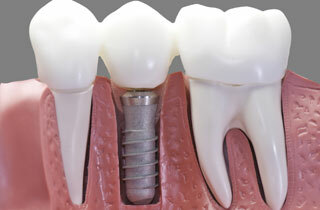 In extreme cases it can be necessary to take out the implant itself in order to solve the problems. Experience proves that this kind of dental implant problem is almost always due to mistakes made by an inexperienced dental surgeon. However, a certain (slight) amount of tissue damage is normal. You can expect slight bleeding and some pain in the days following the surgery. This does not mean complications with your dental implant. But if the pain is very strong and the bleeding is heavy and does not stop after a few days, you should contact your dentist or the dental surgeon in charge of your implant. There can be complications when the dental surgeon chooses the immediate loading implant over the two-step implant. Immediate loading means that when the surgeon inserts the implant in the jawbone during the same setting also adds the abutment and the crown. Differently, the traditional, two-step method gives enough time to the implant to blend in with the bone tissues around it before the dentist adds the part above the gum (i.e. the abutment and the crown). On the other hand, if there are no complications, immediate loading implants have the advantage of needing less time for post-surgery treatment and aftercare, and of offering a faster recovery. A possible source of complication is the overloading of the implants. This may occur when there is too much pressure on the abutment and the crown. This external force can interrupt the process of bone integration, i.e. the process during which the dental implant blends with the surrounding bone tissues. Patients with insufficient amount of bone mass should avoid immediate loading implants. Problems with the sinus can be a real challenge for the dental surgeon when building implants in the upper jawbone. The bone structure of the sinus, the inadequate quantity and quality of the bone mass in the rear jaw bones can make dental implants quite difficult in this area of the mouth. In order to strengthen the bone tissue the surgeon can decide to increase the sinus floor. It means lifting the existing bone structure to make room for bone grafting. The aim of this intervention is to create a sufficient amount of bone mass capable of embodying and supporting the implant base for artificial teeth. The dentist must inform the patient about the eventual problems caused by the sinus floor before beginning the implant procedure. In addition to what we have described up to this point there can be other problems with dental implants – although we want to highlight the fact that all these difficulties only occur in less than 2 percent of dental implant surgeries. Among these problems we can mention rejection, complications due to faulty implants and allergic reactions. We will also briefly present cases in which dental implants are contraindicated. Just as with any other kind of implants, the patient’s organism can either accept or reject dental implants. If, for whatever reason, the patient’s body refuses to accept the implant, it simply won’t be embedded in the bone tissue. The base of the implant inserted in the jaw bone is made of metal, most often of titanium. However, it might still break or become crooked. Thanks to continuously improving implant designs and materials this dental implant problem is quite rare nowadays. External factors can damage or break implants. Such factor can be a sudden strong blow hitting the face, or some constant, excessive pressure on the implant, caused maybe by teeth grinding (also known as bruxism) or an unbalanced way of chewing. Dental implants are made of titanium alloy, but can contain traces of nickel. In some very rare cases patients can turn out to be allergic to titanium. For others it can cause inflammation. Symptoms can be very different, varying from itching to Chronic Fatigue Syndrome. Up to now MELISA test is the only scientifically founded method to establish if a person is really allergic to titanium and to what extent. After reading this article one can get the impression that there are numerous circumstances making dental implants difficult and risky. Therefore we would like to repeat in this conclusion that the above listed complications occur only in a very low percentage of the surgeries. At least 95% of dental implant procedures take place successfully, without any of these complications.